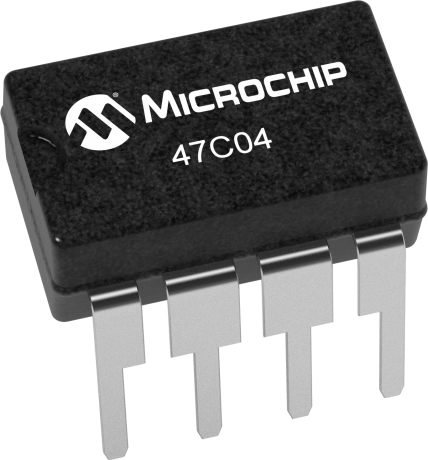 The Microchip Technology Inc 47C04 EERAM is a 4Kbit SRAM with EEPROM Backup. The I2C EERAM Memory is a Low-Cost NVSRAM that Eliminates the Need for an External Battery to Retain Data. The device is organized as 512 x 8 bits and utilizes the I2C serial interface. The 47C04 provides infinite read and write cycles to the SRAM while the EEPROM cells provide high endurance non-volatile storage of Data. With an external capacitor, SRAM data is automatically transferred to the EEPROM upon power-loss. Data can also be transferred manually by using either the hardware store pin or by software control. Upon power-up, the EEPROM data is automatically recalled to the SRAM. Recall can also be initiated through software control. The unlimited endurance makes the EERAM useful in applications that need to constantly monitor or record data. The 47C04 EERAM has a 4.5-5.5V operating voltage range and is available in 8-lead SOIC, TSSOP and PDIP packages. The EERAM works from -40C to 125C and is automotive grade qualified.